Reb your chapatti's look really yummy . I can provide one more tip. Instead of yogurt try milk. which will make chapatti more soft . It will also taste different. These are called phulkas. 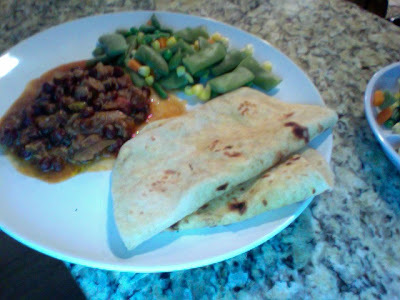 The dough mixture is the same as for chapatti's but its cooked on hot griddle without any oil. Its healthier for calorie conscious folks. Put phulka on the hot griddle/skillet. Cook for about 1 minute, until the top starts to look dry and small bubbles start to form. Flip and cook the other side for about 30 seconds until small bubbles form. Take the phulka off the griddle/skillet and turn the heat to medium, and put the phulka directly on the flame. It should balloon into a spherical shape and puff up. Remove from fire and spread ghee one side and serve hot. The tips on chapathi are very useful Being a South Indian , I was very poor at making them .Always mine turned out as pappads :( till I got some tips from friends. Jasmine looks cute and I love that independent thinking very much..he he. you daughter is so very cute!!! she`s so cute! we are in the same dilemma. my son is also on an independence streak and only wants fish.im glad it`s fish though. I really have no idea about Jasmine! 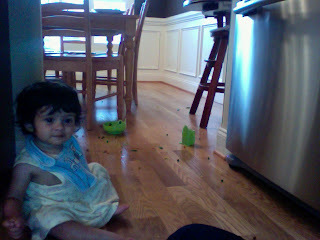 B'coz my kids never throw things or foods in this way! Probably, you can try making up stories with some toys eating with her. You know, kids always have good imagination! But these days, kids are getting really active, they juz won't stay quiet! The rebellious stage! I'm sorry I have no advice for you.These chappatti's sound so good - thanks for all the tips. I love Indian food! I have not yet attempted to make a chapatti. It doesn't sound as difficult as I was thinking...during my time in Indian I watched the women make them and enjoyed eating them! I will give this a try.